I just created a new display for OSRAM Seven Screens in Munich on behalf of ART+COM, Berlin. 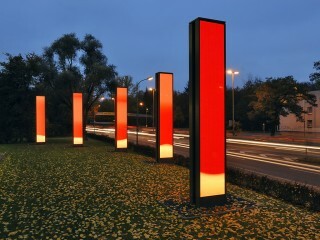 OSRAM Seven Screens is an installation of seven double-sided vertical screens in front of the OSRAM main office in Munich, next to the highway “Mittlerer Ring”, one of the most congested roads in Munich and Germany. For the display Reactive Sparks, the traffic on the street is tracked in real-time; each car creates a spark which moves across the screens. The Waves in the lower part of the display represent the amount of traffic in the past few minutes. More traffic results in higher waves with faster movement. The installation conveys the idea of energy and movement and translates it into a visual representation. The warm colours create a warm spot in the gray winter landscape. The display will run until April 2008. I designed the display in collaboration with ART+COM and realized the programming in Java and OpenGL. I recently finished the animation programming of an icon generator for T-Mobile. Users can create their own avatar and download it to their mobile phone via bluetooth. You can play with it in many T-Mobile shops, mainly the T-Punkts. 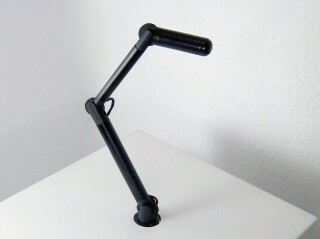 The design and project management was done by Mutabor, Hamburg. Update: The MyFaves Icon Generator won the IF Award for Communication Design and the Red Dot Award in 2008. My colloborator Andre Stubbe and me took our robot, Outerspace, through a long process of enhancement. After an extensive reconstruction with 3D modelling software, the new hinges were made from Delrin with a state-of-the-art 5-achsis CNC machine. From 1 May 2007, the new improved Outerspace will be part of the permanent exhibition at the Museum of the Future, part of the Ars Electronica Center, Linz, Austria. You can interact with the robot in the RoboLab on the first floor. It is part of the theme field “With all Senses”. The new location of the Ars Electronica Center in Graben 15 in the heart Linz town, Austria. The opening week starts on May 16, 2007. Outerspace is the Winner in the category “Interactive Installations and TV” and the “Overall Winner” of the EUROPRIX Top Talent Award 2006 in Vienna. Thank you! I’m planning to cover the metal wire construction with a soft white fabric, that has good extension properties. I found three materials which are currently in the competition. From left to right, gaining in opacity: women’s stockings, a body suit and swimming fabric. Lets see which one is going to make it. I just got back from my frist trip to India. I had only two weeks – a very intense, exciting experience. 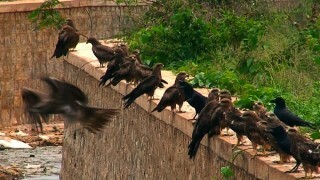 I was great to see so many of the German national birds, the eagle, mingle in India. This picture was taken just by the road from Bangalore to Mysore. I posted many pictures from my first trip to India on Flickr. www.norwichtextiles.org.uk just went live. 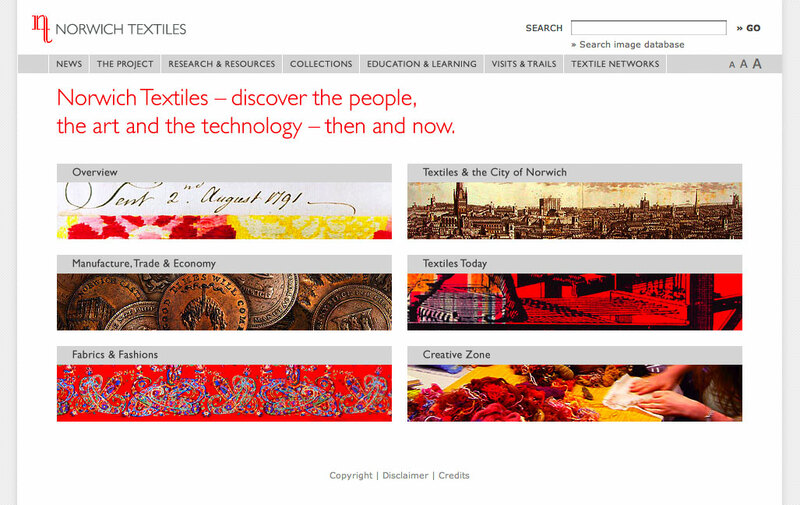 It’s a comprehensive website about textile culture, art and technology in the City of Norwich (East England). It features an extensive history section, interactive textile trails, educative resources, visitor information and an online image database. It was designed and developed at Studio Bec by Gero Grundmann and Markus Lerner for Norfolk Museums and Archaeology Service and Norfolk School of Art and Design. Outerspace got nominated for the Top Talent Award 2006.
at the Top Talent Festival in Vienna. Andre Stubbe and me got a Honorary Mention for the reactive robot called Outerspace at the Prix Ars Electronica Award 2006, the international competition for cyberarts. 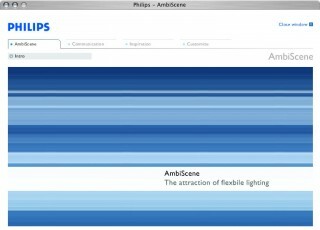 Philips AmbiScene is a rich content themesite on flexible lighting. Like for Philips City People Light, I designed the menu and page animations and did the flash programming. The graphics and the layout were designed by Jung & Pfeffer, Bremen.